Are your documents as safe as you think? Damp, theft and damage. 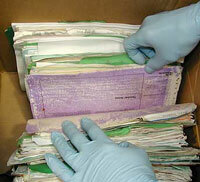 These are three of the biggest concerns for people storing important documents. Whether you’re storing them yourself in your own buildings or whether you’re using an outside document storage facility, there’s always a risk, no matter how secure and reputable the supplier or building you’re in is supposed to be. A lot of documents held by companies contain highly sensitive information whether it’s private staff data, files needed for legal requirements, contracts, HR documents or anything else. It all needs to be kept and after a while it builds up and is susceptible to potential damage. The trouble with an issue such as damp is that you don’t always see it coming. The featured picture shows damp that is quite apparent but, as you see from the picture underneath that, it’s not always the case and can cause some serious damage to your papers. It’s not just an issue in older buildings either. ‘The Building Research establishment (BRE) in its review concludes that rising damp is a real problem. The Building Regulations for England and Wales specifically calls for the inclusion of a damp-proof course in all new properties but this doesn’t mean that it actually happens. If walls are damaged or are not properly put together, damp can still find its way in. Damp will pass to surfaces like cardboard and paper which can cause mould and fungus. Very recently, there was a great deal of concern for the historical documents in the town of Beaconsfield, home to the likes of Enid Blyton and Robert Frost, according to the Bucks Free Press. So it’s not just businesses who potentially suffer at the prospect of damp, it’s also essential documents which hold a great deal of importance to the country itself. Due to a decrease in the quality of new buildings being built and older buildings not being maintained properly and brought up to standard, damp has become a serious problem in the UK. 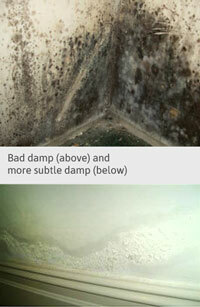 From the picture on the right you can see that there are different kinds of damage caused by damp which is both apparent and more difficult to spot. If you have a room full of documents or boxes containing files, then it’s going to be even harder to spot. Paper is delicate and it’s quite ironic that we store such important data on something as easily damaged as paper. However, it’s one of those things that we have done for as long as we can recall and we will probably continue to do it for a long time. But, because of this, paper is prone to damage, whether this is water damage, rips and tears or even accidental destruction. Continuous use of documents does often lead to them becoming more and more difficult to use because of rips, tears and even fading. As people we are not always as careful as we would like to be and things like this happen, but for important documents this can be an issue. That combined with water damage from damp premises or roof leaks can cause a painful and messy issue. The prospect of fire damage is also something that can’t be helped. You can put everything in place to prevent damp and even water damage but fire is one of those things that’s incredibly difficult to predict and to put in place protection for your documents. Fire is, of course, the ultimate killer for paper based documents as nothing will be retrievable in this event. Like many, you may be of the belief that your documents aren’t worth stealing to the average person on the street, but it’s not always the case. Often during burglaries documents can also be stolen or damaged during the process of stealing other, more valuable items. It’s even been known for disgruntled former employees to take issues out on their former company by taking important documents, even if it’s just a few. This can have devastating effects if the files aren’t properly backed up or duplicated. Theft is also on the rise due to the poor state of the economy and extra security is always advised. However this can be a hugely expensive solution to the problem. In their current state, there’s not a great deal that you can do to prevent issues with your documents, but one path worth considering is scanning bulk documents. Getting your documents scanned in bulk not only significantly reduces the chances of them being lost, stolen or damaged, but also enables them to be backed up as many times as you like. On top of this, the documents are more flexible, easier to access and productivity and morale amongst your team will grow too. Document scanning is also pretty good value for money as it starts from under a penny per sheet. You would also be able to lock any folders that contain the documents so that only a signed in admin on your team would be able to remove them from their location or delete them. With these extra measures costing little to no money, your documents will be safer than ever without breaking the bank. If you would like some more information about how digitising documents with Pearl Scan and bulk document scanning can help your company protect that important information, get in touch today for a free, no obligation quote.